1. Use only stiff cement mortar for raising a glass block wall and pointing up joints. (1 portion Portland cement, 3 portions sharpedged sand with grain size not exceeding 3mm). In order to improve plasticity, hydrate of lime or tars may be added, yet the amount added should not exceed 20 per cent in weight of the cement portion. 3. The spacing between glass blocks should be at least 10 mm. The expansion joints must not be rendered ineffective by plaster, plating, etc. On the outside, the expansion joints are to be sealed with permanently elastic putty to prevent moisture from penetrating. 5. Glass block walls should not be erected at temperatures below + 5° C.
6. Reinforcement depends on statical requirements. For more detailed information contact us. 7. 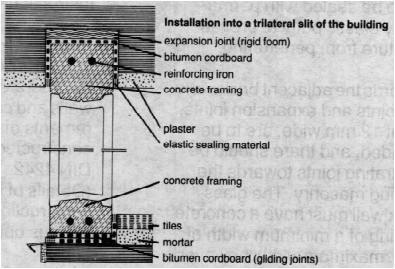 In case you use reinforcement, make sure that the reinforcements are well covered with mortar and that a minimum distance of 5 mm between reinforcement and glass block is observed. 8. These instructions are not to be considered as substitute for the detailed installation instructions laid down in DIN 4242, "Glass Block Walls, Construction and Design Data". 9. All glass blocks in the size of 190x190x80 mm can be incorporated in fire resistant walls and comply with the requirements of DIN 4102 if constructed as laid down in DIN 4242.